Taking good pictures doesn't always mean taking sharp pictures. Sometimes, a blur in the right place helps ad excitement to a picture. When you take a picture, your exposure is a combination of ISO speed, light, shutter and aperture. You can't often change the light. So that is somewhat of a "given". Your control is with your ISO speed, aperture and shutter. If you decide that depth of field is important in an image, then you'll want to control your aperture. But if you decide that motion is important in an image, you'll want to control your shutter. When photographing a moving object, it's sometimes nice for something in the picture to be blurred so as to show that there is movement in the final picture. This can be a difficult technique to master, and quite frankly, nobody has mastered it where they get a good picture every time. 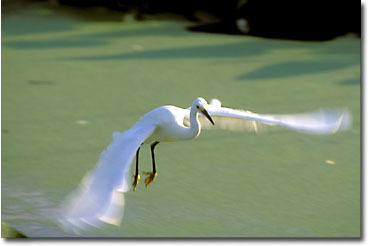 The idea is to set your shutter speed slow enough where some motion will be captured. The best application of this technique is in "waterfall" photography. 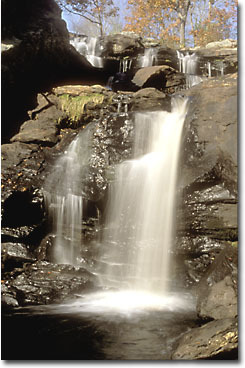 By putting your camera on a tripod and using a very slow shutter speed (1/2 second or slower) the tripod will help assure that the picture is sharp but the slow shutter speed will assure that the falling water is blurred. The water takes on a soft ethereal look which can be very pleasing. Very often, there is too much light to use such a slow shutter speed. The solution to that is to use a neutral density filter. Neutral Density filters are dark gray and don't influence the colors of a picture, but can substantially reduce the amount of light that reaches the sensor. If your exposure is f16 at 1/30 second, a 3-stop neutral density filter will allow you to take the picture at f16 at 1/4 second. Enough to blur the water. Just remember, that sometimes, blurring can be a good thing in a picture!